Happy Solstice everyone :) I don’t know if you realized, but yesterday was the longest day of the year?!?! I find it odd that the longest day of the year is actually earlier on in the summer, but I’m not complaining. I love summer and Seattle is getting longer, warmer days each year that I live here. Seriously, the sun sets after 9 pm and we are experiencing highs in the 90s BEFORE “the official” start of summer in Seattle (aka 4th of July weekend). Fremont, which is undoubtedly the quirkiest neighborhood in Seattle, and also refers to itself as, “The Center of the Universe” throws a fair for Solstice. There is even a parade and this may be one of the most free-spirited parade routes in the country…it starts off with naked, body-painted, cyclists. If that doesn’t welcome summer, I don’t know what does. We kicked off the weekend with a mimosa brunch, build your own breakfast burrito bar, and spent the afternoon watching the parade festivities. Andrew and I were lucky to be a part of a friend’s proposal later that night and continued celebrating into the evening. Talk about making the most of a long day! Today, the day after Solstice, is all about relaxing and some meal prep for the week ahead. 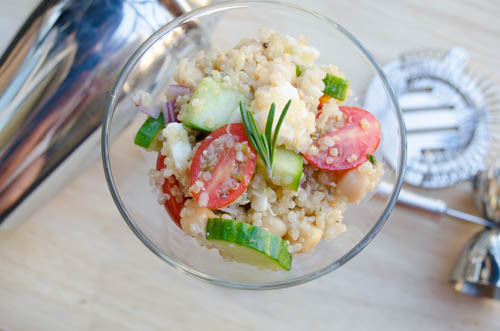 Quinoa salads are a great, healthy, easy, and versatile recipe to throw into your meal planning routine. 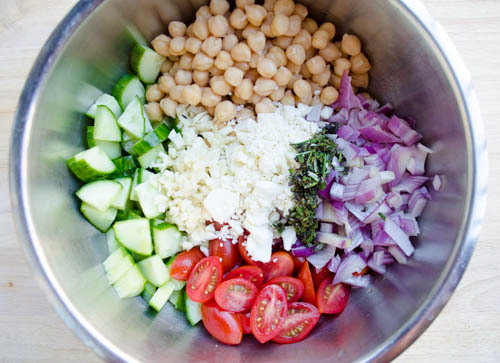 With all the warm weather, there is so much yummy produce, and a light salad is one of my favorite work lunches :) This is a twist on one of my favorite Bosnian dishes –šopska salata (Shopska Salad). 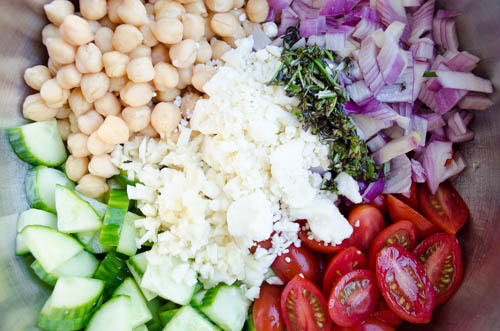 This salad is a staple in many Balkan countries. Traditionally, the salad is comprised of tomatoes, cucumbers, garlic, peppers, onion, feta, olive oil, apple cider vinegar, and salt. Here in the U.S. it is difficult to find the green peppers that are custom to The Balkans, so I omit the peppers because bell peppers just don’t taste the same. 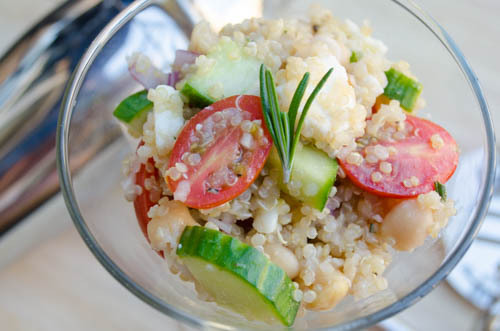 The quinoa and beans are great protein boost and the I love to change up the flavor by adding whatever fresh herb I have on-hand. Today it was rosemary, but basil and parsley work nicely too. I decided to have some fun with the pictures for this post and get a lil’ fancy since the rest of my day has been pretty casual ;) I hope you all had a happy, safe Solstice and are excited for the rest of summer!